The key to this recipe is ensuring you marinate the beef and have everything prepared and ready to add to the wok so you can cook and serve without delay. 1. In a bowl, mix together the sesame oil, soy sauce and grated ginger, then stir in the beef strips and leave to marinate at room temperature for 15 minutes. 2. Heat a wok and stir-fry the beef for 4-5 minutes until nicely browned and cooked through. Transfer to a clean bowl and set aside. 3. Add the sunflower oil to the wok and stir-fry the red onion, broccoli, mushrooms and chilli for 5 minutes until tender. Return the beef and any resting juices to the wok and stir in the oyster sauce and vinegar. Continue to cook for 1-2 minutes until piping hot. Scatter over the salad onions and serve with rice or noodles. 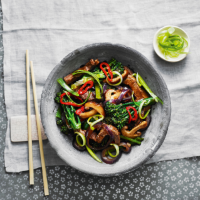 Cook’s tipTry swapping the fresh shiitake mushrooms for ½ x 300g pack frozen Cooks’ Ingredients Exotic Mushroom Medley. This recipe was first published in Thu Jan 26 11:49:00 GMT 2017.